Alastair Cook raises his bat to the stands. West Indies had another tough day as Alastair Cook piled more runs and misery on the Caribbean side on Friday's second day of the day.night first Test at Edgbaston. The former captain became the highest scorer in Tests as England declared their first innings on 514 for eight. 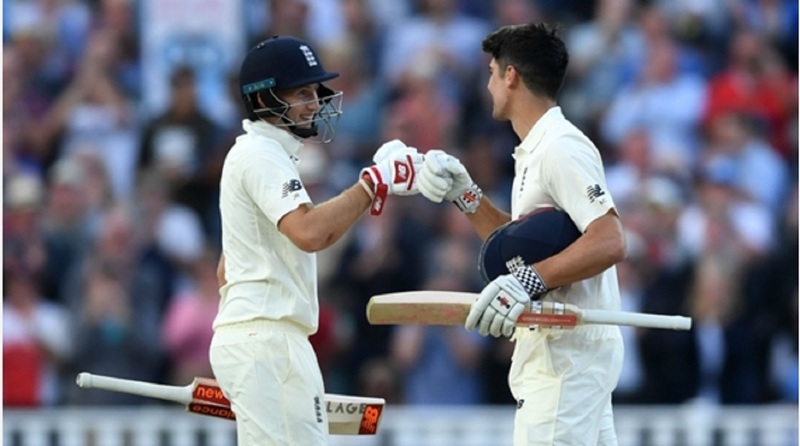 Cook shared a 248-run third-wicket stand with new skipper Joe Root on Thursday and played with typical poise and judgement to turn an overnight 153 into 243. 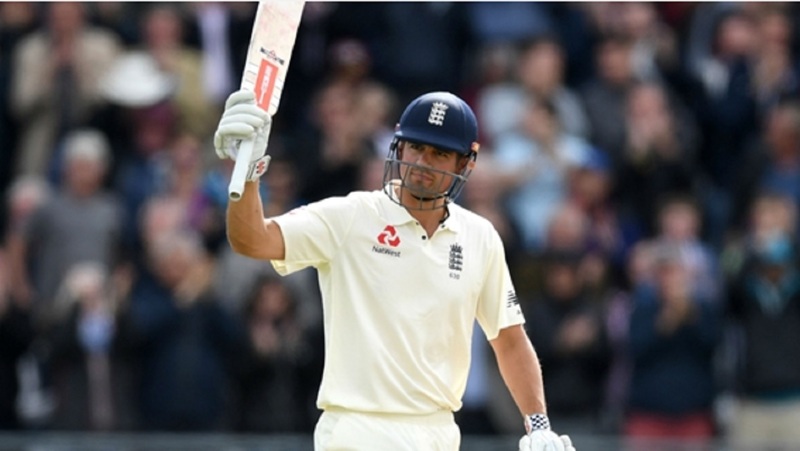 Cook's knock, his third highest in Tests, saw him set a new Edgbaston benchmark and earned a rousing reception from the stands, while Dawid Malan's knock of 65 – a career high in the longest format – also contributed to England's imposing first-innings total. Having taken a hammering with the ball, the tourists lost Kraigg Brathwaite (0) early in their reply, but Kieran Powell (18 not out) - dropped on two - and Kyle Hope (25 no) battled on before play was brought to a premature close in the final session due to rain with West Indies on 44 for one, 470 runs behind. A mix of continued favourable batting conditions and lack of spark from a lacklustre Windies attack allowed Cook to coast towards a fourth Test double century in the opening session. The landmark was reached in a way that rather epitomised the Windies' misery when Cook slashed a single to third man, only for Hope to comically trip over his own feet and allow the ball to trickle to the boundary. That was met with an almost sheepish raise of the bat from Cook, while at the other end Malan – who saw a thick edge evade slip when on two on Thursday – reached a personal milestone of his own. His overnight 28 was turned into a first Test fifty with a drilled pull through square leg and Malan will be disappointed that he poked Roston Chase behind on the stroke of tea with runs there for the taking. Cook continued to plod on, but Ben Stokes (10), Jonny Bairstow (18) and Moeen Ali (0) failed to add meaningful scores. When the improving Chase (4-113) had Cook trapped lbw, after a successful review, that prompted a swift declaration and rapturous applause from the Edgbaston crowd. England made a quick breakthrough when Brathwaite nipped James Anderson behind to Bairstow. Powell's loose slash off Stuart Broad was then wastefully dropped by the usually reliable Stokes at gully on two. There were few other chances for the bowlers, though, as Anderson was tamed and Broad struggled to get to grips with the pink ball, but the visitors will begin day three still 470 runs in arrears. Scores in the game going into Saturday's third day are: England 514 for eight declared; West Indies 44 for one.